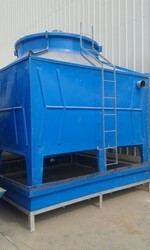 We are a leading Manufacturer of fiberglass cooling tower from Ahmedabad, India. Temperature 50 C. to 31 C.
we manufacture, export and supply an optimum quality of Fiberglass Cooling Tower . In order to manufacture this tower, our dexterous team of experts use superior grade raw materials and pioneering technology in compliance with the international quality standards. Our offered tower is used in frozen series, air conditioning system, injection moulding, power generation, industrial cooling water and other fields. Moreover, this Fiberglass Cooling Tower is available in different capacities and specifications at most affordable rates. Looking for Fiberglass Cooling Tower ?